The SoCalCycling.com Elite Team was formed eleven years ago and in those eleven years the Team has been on board Cannondale bikes. The Team started with the aluminum CAAD7 and has been riding the Cannondale SuperSix EVO’s for the last three years after coming off the stellar CAAD10. This year we had the opportunity to ride the Cannondale SuperSix EVO HI-MOD. When you’ve been around for awhile and have been able to ride many bikes over the years, you really can appreciate a great bike and the Cannondale SuperSix EVO and CAAD10 are among the best bikes on the market and the Cannondale SuperSix EVO HI-MOD is the best all around bike for climbing, sprinting, descending and being the most comfortable while doing everything. It will be hard for Cannondale to top these bikes when they come out with a new bikes in the future. However, they went back to the drawing board/computer and recently introduced the new Cannondale SuperSix EVO HI-MOD. Check back as the Team will be riding and testing them out for next year. 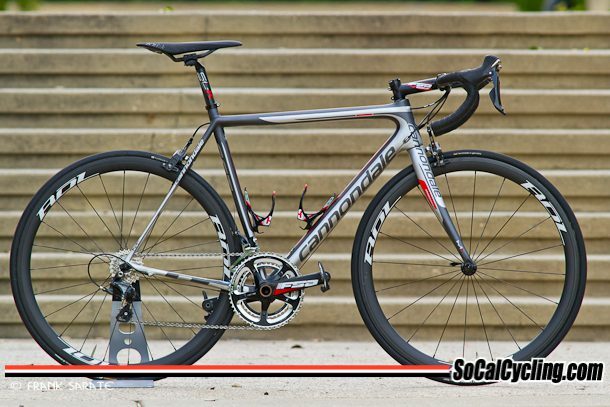 In 2015, the Team rode the Silver/Charcoal/Red color edition of the Cannondale SuperSix EVO HI-MOD with FSA components, TRP brakes, Fi’zi:k saddles, Continental tires and ROL Wheels. The Team also had great support from SUGOI that gave the Team a pro look. Clif Bar and Clif Shot nutritional products keeps the Team fueled when training and racing. SoCalCycling.com is grateful for the years of support from these fantastic partners that provide the Team with some of the best equipment on the market and allows the Team to achieve their goals year in and year out.